While we love the futuristic capabilities of smart baby monitors, there is something to be said for simplicity. Mastering complicated tech is not something many anxious and sleep-deprived new parents want to tackle on top of learning to take care of a newborn. 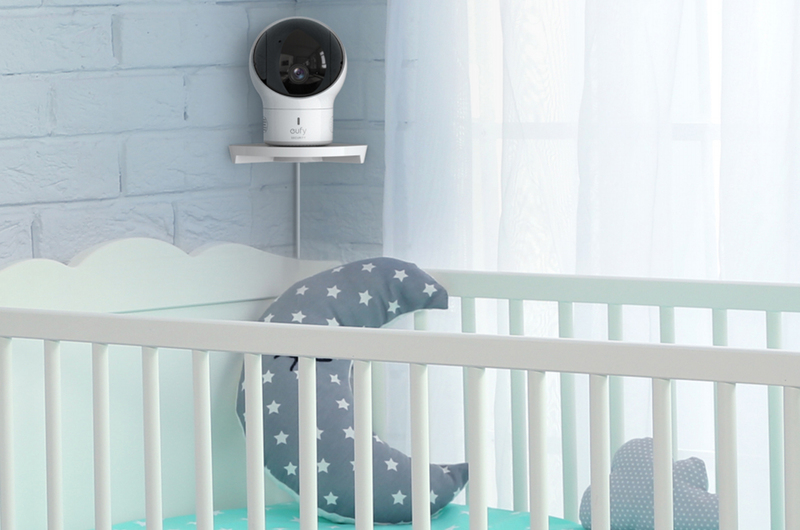 Eufy’s SpaceView Baby Monitor walks a welcome middle ground, blending just the right amount of forward-thinking features with a capable camera that’s easy to setup and operate. The Spaceview system consists of a single camera and an HD monitor, both of which feel a lot more substantial and durable than some other sets of this type. The camera has a built-in mic and speaker, can pan 330 degrees and tilt 110 degrees, and features 2x digital zoom. And in a unique twist, it comes with two separate lenses. A 62-degree pre-installed lens gives you a clear view of your baby within 6- to 10 feet of the camera. 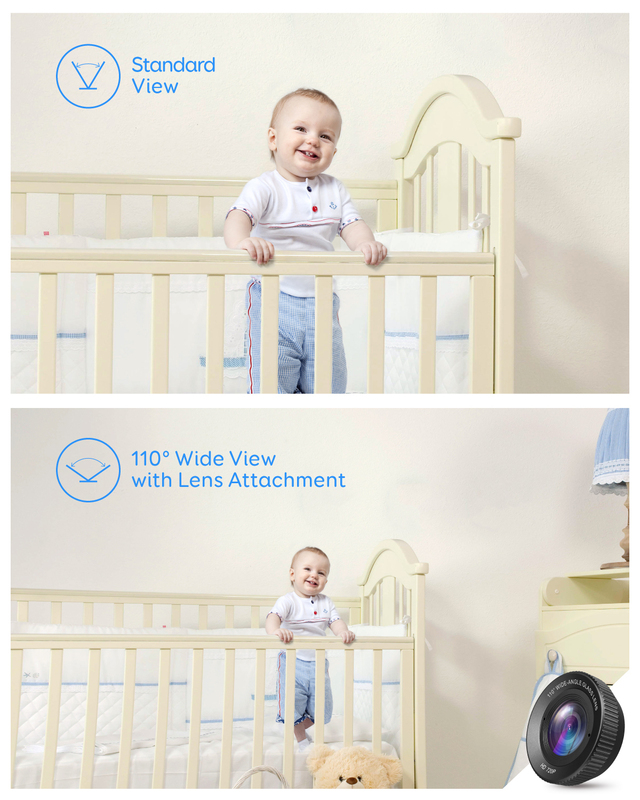 A second 110-degree lens can be attached to give you a wide-angle view of the child’s entire nursery. The monitor has a 5-inch, 720p display. To the right of the display are a directional pad and buttons for activating the unit’s menu and push-to-talk feature. The unit is small enough to tote around with you and it has a coverage area of 460 feet, but a stand flips out from the back when you want to set it down on a nightstand or table. The system is easy to set up, so you can quickly get eyes on your little one. First, you plug each unit into a power outlet using its supplied Micro-USB cable and adapter; you can untether the monitor once it’s fully charged, but the camera must stay plugged in. You then select “add a camera” from the monitor menu and press the pairing button on the back of the camera. I had the system running in less than a minute. The camera can freestand on any flat surface, but a corner wall mount comes with it, so you can get it right next to your baby’s crib. The monitor provides a crystal-clear image in day or night-vision mode, even when fully zoomed. (There are three three preset zoom settings accessible from the menu, 1.5x, 2x, and Off.) Unlike a lot of VGA monitors, the image has no troublesome color cast, though it does tend to turn deep blues purple. The image was equally crisp once I installed the wide-angle lens. This is done by simply screwing it on top of the embedded standard lens. The ability to change viewing angles makes it easy to keep close tabs on your sleeping infant, then go wide when they’re on the floor playing. It’s a smart idea and well-executed. The directional pad used to navigate the monitor’s menu is also used to pan and tilt the camera. The camera’s movements are smooth and true and stop the instant you depress the controls. The push-to-talk feature is also instantly responsive with clear sound, but I had to get right up to the monitor for it to register my voice. Across the top of the image, the monitor displays the current temperature and sound level in the nursery. At night, you can enable sound-activated alerts, which let you set a sound threshold. This keeps the monitor in standby mode, turning the screen and speakers on only when that threshold is breached—and waking you with an insistent beeping—so you don’t need to keep an ear tuned to your child’s stirrings all night. The SpaceView Baby Monitor is an excellent option for new parents. It has much better image quality than most of the handheld monitors we’ve reviewed, and the clever implementation of multiple lenses assures the camera grows with your child as they get more mobile. Best of all, it provides the features that are most likely to give you peace of mind without bogging you down in a lot of tech configuration. If you need a baby monitor and aren’t quite ready for the type that works with your smartphone, put this one at the top of your shopping list.